Learn how to play head-to-head Matchmaking on Challengermode. 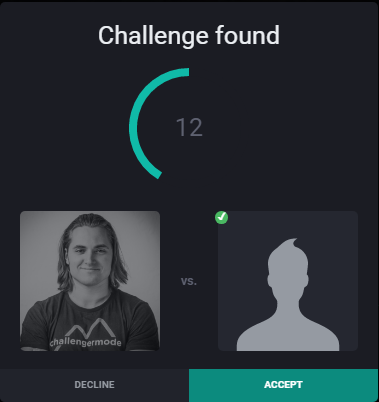 A Matchmaking game on Challengermode is a head-to-head match. It’s player vs. player or team vs. team. Matchmaking is free-to-play right now. Click on the Matchmaking menu item in the left sidebar under League of Legends or Counter-Strike: Global Offensive depending on what game you play. You must accept the Challenge within 30 seconds. By accepting you will start the game and enter the lobby. In the Matchmaking Lobby you will be given 10 minutes to enter the League of Legends client and start playing with the Tournament Code. By entering the queue and accepting a matchmaking game, you commit to starting the game within 10 minutes. Not joining within 10 minutes will result in an automatic loss.